Raggedy Anne and Randy: Our 2004 Road Trip Wedding Prologue « Midlife Crisis Crossover! Hi! We’re the Goldens. This is who we are and what we did this one time. Previously on Midlife Crisis Crossover: in recent weeks we’ve been sharing the stories of our annual road trips that we undertook before I launched MCC in April 2012. Starting from the beginning and working our way forward, so far we’ve covered 1999 to 2003. Making the leap to 2004 first requires a digression for an important milestone. A while back we reprinted the he-said-she-said tale of our relationship in Part One and Part Two of a special two-part miniseries. 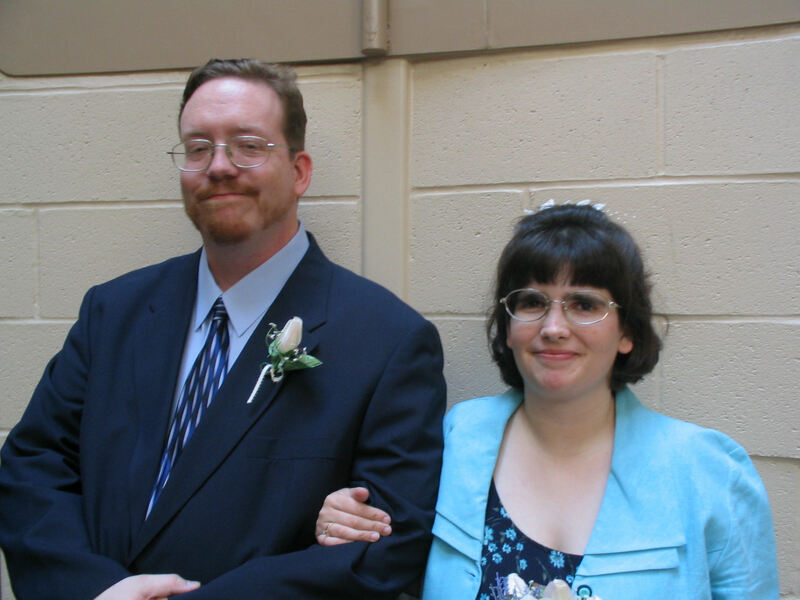 After seventeen years of knowing each other as classmates, coworkers, neighbors, best friends, and eventually an official Dating Couple, in July 2004 Anne and I became husband and wife and our world was never the same, except for the part where we still did road trips every year. The following is a retelling of our blessed, frequently awkward wedding day, a time of joy and music and accidents, two weeks before we embarked on that year’s fun, frequently awkward journey. The following essay was previously shared with a small circle of friends but has been given the “special edition” treatment for archiving here on MCC. The day before the big occasion, Anne had spent two hours making punch for the very first time in her life, using a recipe given to us by one of our Star Wars Celebration II cohorts. She bottled several gallons worth of the concoction of pineapple juice, orange juice and lemon-lime soda in two-liter bottles and put them in her otherwise emptied freezer. And that was after our rehearsal at church. It was mercifully short, but it was hard to get things done because our wedding coordinator — an ordinarily nice lady provided by the church, and a fellow Trekker — kept pressuring Anne to make quick decisions. It was decided against her better judgment to have all wedding photo participants show up the next morning at 10:30 a.m., giving us a chance to get photos out of the way before our 1:30 kickoff. The next morning, Anne got up and spent a couple of hours walking all the wedding gear and accessories from her apartment over to mine while I went to get a much-needed but last-minute new set of tires (which we’d need for the honeymoon drive), bought some last-minute new dress shoes for my son (who outgrew his previous, not-so-old pair mere weeks after their time of purchase) and had a spur-of-the-moment father/son breakfast at Hardee’s…a sweet gesture that kept us guys out till 9:30, leaving one measly hour to pack the car, pick up the cake from the bakery, and get to church. On the way to the church, we realized we forgot our CD player for the reception music. I turned the car around and drove back, but on the way heard my son say from the back seat, “Dad, your shirt is getting wrecked.” My dress shirt and jacket were back there with him. We forgot that liquids expand when frozen, and didn’t realize that carbonated drinks don’t take kindly to the freezing process. The wedding punch in its carefully filled two-liter bottles, having initiated thawing sequence, was now oozing through the caps like overflowing volcanoes all over my marriage uniform. After several tense minutes of cleanup, the two-liters were transferred from the back seat into a cooler and packed under protest in the boy’s lap. Off we went again, speeding to church and arriving right on time after having delegated the cake-fetching duties to one of Anne’s sisters. As it turns out, we needn’t have hurried — almost nobody made it on time, including my cousin the wedding photographer (a smattering of whose pics grace this entry). By 11:15, everyone including my cousin had finally shown up with the exception one of Anne’s brothers. We proceeded without him. Usually wedding photos take hours for your professional photog to create pictorial memories with every conceivable combination of relatives possible, until you get to the final photo three hours later featuring the bride posing with the groom’s third cousin’s brother-in-law and someone’s co-worker’s aunt. With tremendous cooperation, meticulous planning, and a desire on our part to take far fewer photos than standard wedding procedures demand, we finished photos before noon. That left us ninety minutes to kill before kickoff. The solution: impromptu pizza party! And a fun feast was had by a select few. That feeling when you were done sixty-two poses ago but you hang on to the hope that food is coming. By my count we had sixty guests in all. By the average upper-class socialite’s standard I’m sure this barely ranks above a Justice of the Peace office hitching. Frankly I was wowed at how the attendance figure exceeded my humble expectations. Attendees included Anne’s family as well as my own; some of my friendlier ex-in-laws (long story short: at the time we all got along so well that my ex-wife was in charge of Anne’s hair and makeup); co-workers on both sides; a few long-lost friends; at least one major relative on my side I hadn’t spoken to in years; and, alas, no computer buddies because they all rudely lived in other states and countries. As guests trickled in the half-hour before the ceremony, a prelude of John Williams music personally chosen by Anne entertained the crowd — several Star Wars and Harry Potter love themes, as well as “Can You Read My Mind” from Superman: The Movie. Attempts to use love themes from the Indiana Jones trilogy were scrapped in the planning stages due to poor CD design. Meanwhile, ten minutes before kickoff, Anne’s final brother showed up at long last, just a wee bit late for photos. We eventually forgave him. I took pride in hand-picking all subsequent music from ceremony to reception myself. As a concession to tired traditions it was at 1:30 that the official proceedings began with a nondescript yet festive piece from a wedding-music CD. The wedding party entered — our pastor, the Best Man (another of my cousins, the photog’s brother), then me, then the Maid of Honor (one of Anne’s cousins), then the flower girl (Anne’s tiny niece, who in 2017 is a college freshman). Our de facto DJ (not me because I was busy on the main stage, but some young stranger the church brought in) switched gears on cue. An elegant rendition of “Jesu, Joy of Man’s Desiring” heralded the bride’s processional. 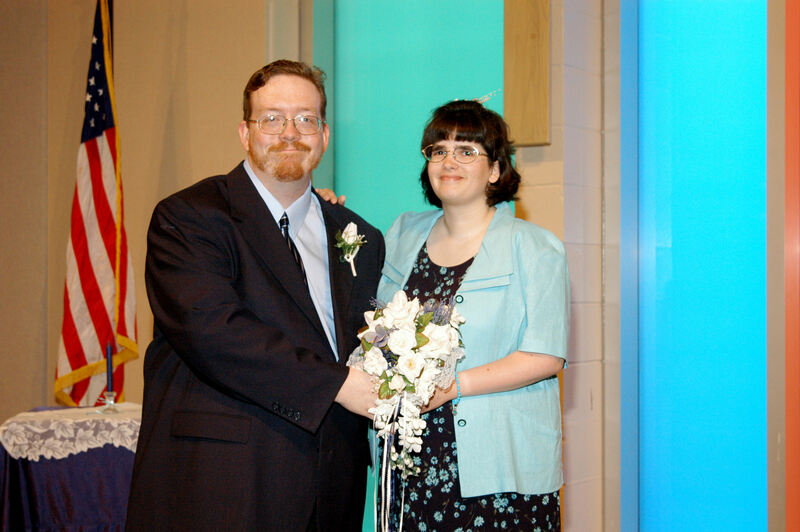 Anne floated down the aisle on the arm of her father right up to the altar. The ceremony itself was bare-bones simple. The pastor’s message was one that, at our request, exalted the benefits of family unity. For their own protection and ours, our mothers were not involved in the unity candle ceremony, which was done to the accompaniment of Hüsker Dü’s “Monday Will Never Be the Same”, a short piano interlude from Zen Arcade. Because no wedding goes off without a hitch, our pastor began the vow-repeating section by tripping over his tongue and referring to us as “Ran and Andy”. We were tempted to make matching name tags for our next Sunday School class. Yadda yadda yadda, we were pronounced husband and wife. The recessional music: “Pines of Rome”, best known nowadays as the number from Fantasia 2000 where the whales fly through space. The receiving line afterward was the only time that we got to see all of our wedding guests, including my son nagging us to let him change out of his dress clothes, who welcomed his new stepmother into the family by grabbing her bouquet and hitting her with it. I think it was meant playfully. I’m told these were very good cakes. A full sheet cake was reserved for just the guests, while my new mother-in-law had finally agreed at the last minute to contribute a small two-tiered cake for the bride and groom to cut into for their cake-eating picture, then save the top for our one-year anniversary. Anne had wanted to cut and serve the cake so as to be able to greet all the wedding guests, but was pushed away by one of her stepsisters and the Best Man’s wife. Admonishing her usurpers to leave the two-tiered cake alone, Anne went off to mingle with as many guests as possible, while I tried my best to find a comfortable spot away from the crowd because that’s a thing I do at parties and is why I held and attended very few of them as a kid. Disposable cameras had been placed on all the tables so we could get candid shots of the reception, and boy, were they candid. I considered sharing a few here, but couldn’t bring myself to revisit them. Well-meaning, but not exactly award winners. 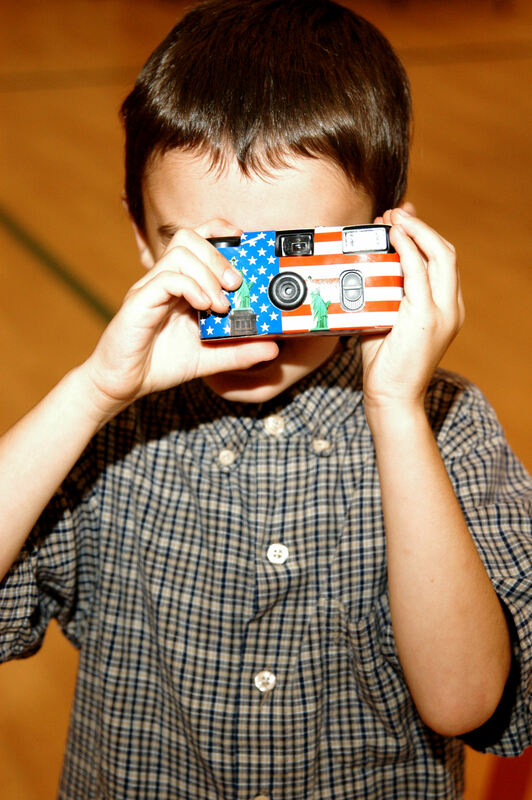 At one point a young step-nephew got hold of one and shot film as only a four-year-old can. Anne’s brother took one into the bathroom and took pictures of the toilet and shower. Far, far too many people could not figure out how to use a flash. As one of our nephews demonstrates, we learned many in our family were better in photos than taking them. The punch was a hit with all but one critic. One of Anne’s friends overheard my mother-in-law in the kitchen tossing her cup into the trash and proclaiming the punch “awful”. Our informant expressed some concern later that this was not very supportive. Anne simply believes her mom thought the punch was the handiwork of Anne’s stepmother and therefore to be condemned on principle. There’s a reason “family unity” was our sermon theme of choice for the ceremony. Tragically, the desire to keep the little two-tiered cake uncut went unheeded. It was all gone by the end, including the aforementioned portion that tradition demanded we save in our freezer until our first anniversary. 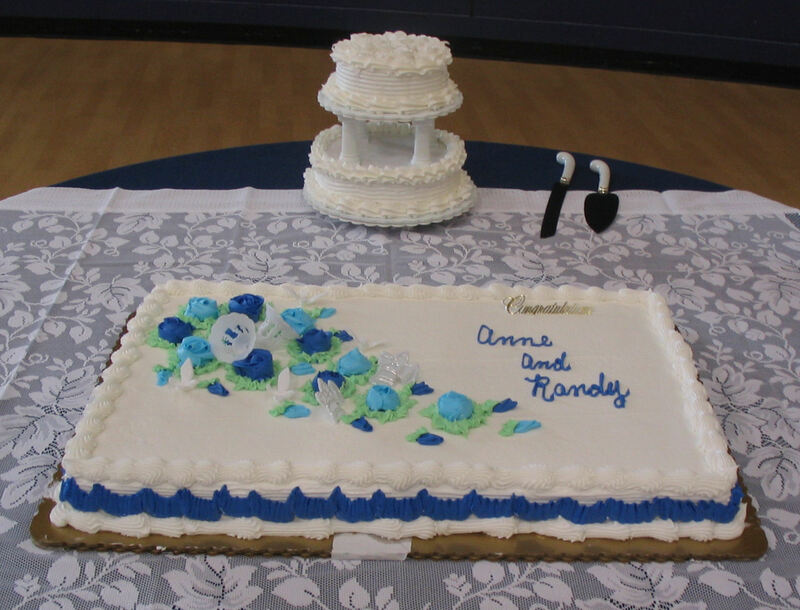 Thanks to overzealous servers, Anne had two literal bites of wedding cake; I had only one. Our low-key gala ended prematurely when the power went out throughout the entire church for about two seconds, reasons unknown. The lights in the reception hall, working at their own pace, took ten minutes to pop back on. For a time, everyone thought we were encouraging them to get out. We’d planned as much, but not that soon. But, y’know, whatever worked. The two of us were tired from all the wedding procedures and impromptu hi-jinks, and ready to call it a day. We let leavers leave and finished cleanup with the help of benevolent stragglers. By that time I think my clothes had finally stopped smelling like Juicy Juice. And with that, Mr. and Mrs. Golden hit the road for their honeymoon. No flights, no island getaways, no five-figure price tags, no barrels of alcohol — just the two of us on a short road trip to a pretty location. We’re the Goldens. It’s who we are and what we do. « Lego. Batman. Movie. Three Products in One!